If you sit at the foot of our mast and look up its 27 metres of length it seems to touch the night; this was somewhat disconcerting as we arrived into Puerto Calera Marina on Lanzarotte at around 9pm. We slithered beneath the underbelly of a commercial aircraft making its final approach to the airport totally unaware that we were sailing under the airport flight path with a twin engine turbo prop (flying conspicuously lower than most jets) looking like a bird about to fly in and roost on our mast! A few beers and 5 days were spent on “Grottie” (nicknamed such by Chris and Clare Berry). The Berrys keep their yacht “Joy” at Puerto Calera as Brits who wish to escape the brutal English winter and catch some “rays” all year around. The time was fast approaching for us to farewell Rob and Belinda and, because their holiday had been consumed with boating domestic duties and making passage, we thought they should do some sightseeing and so we hired a car. 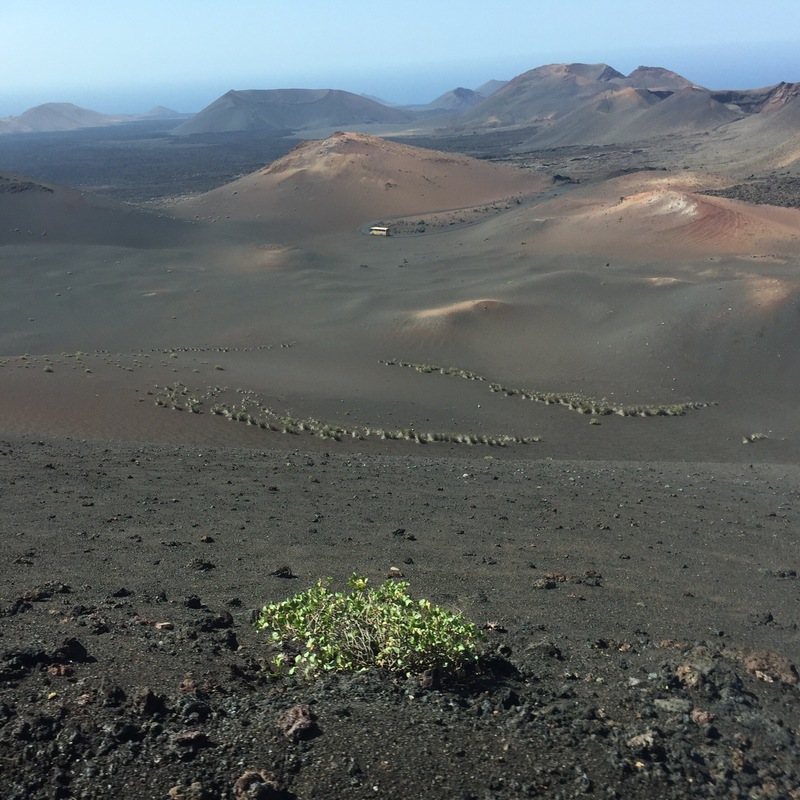 We spent a day at a cracking pace visiting the National Park (not one filled with flora and fauna) which was created by 2 volcanic eruptions, 100 years apart and which looked more like a lunar landscape than a National Park! Our entry ticket included a bus tour of the area and a short stop at the park restaurant to see chicken being cooked over the smouldering lava rocks deep within the earth. Then a drive to the coast and a seafood lunch of spectacular proportions accompanied by some of Lanzrotte’s delicious cold rose was most enjoyable ! Frank headed off the following day leaving James and I for some lone time which we have spent doing paperwork! Yes – it follows you everywhere!! Then, when the marina was quiet (except for our Mexican neighbours who are still up socialising on deck at 4.30am) we slid out to sea headed for Las Palmas. Marina life is an interesting phenomena in itself; in some ways it is like living in a close and friendly neighbourhood but with manic social overtones. When a new boat arrives into the harbour heads pop up from yachts like meercats to inspect the new arrival. There is good and bad in changing neighbours on avery regular basis, particularly if they come under the heading of over-friendly or grumpy old men. On the whole though the sailing/boating fraternity are interesting and interested people. Sharing amenities can also be enlightening, particularly when unselfconscious European women of all shapes and sizes disrobe in the showers!! The constant changing of access to the bathrooms can be testing – I spent 20 minutes trying to exit the Ladies room (being the only one in there on a late Sunday afternoon) and James had 7 missed calls from me on his mobile phone! Time disappears in the flick of an eyelid and many hours can be accounted for in waiting for bureaucratic processes to be completed. To have Miss T hooked up to shore power here, we needed a 16 amp converter to go on to our 32 amp power cord. Normally you can hire these at any marina office but when James took his number (as you do in the bank) and waited for 2 hours he was told they did not have any. The rest of the day was spent trying to put one together (we had not taken into account “siesta” from 1pm until 4pm) and by day’s end we had a bespoke new lead. We hurried back to the boat with glee only to find it didn’t fit. Despondently we headed for the bar (Miss T is docked right in front of the most popular drinking hole in the marina – good and bad) only to meet up with our Oyster friends who had a spare converter – a wasted day with a successful outcome! Tonight the first of our ARC+ crew arrives which heralds the beginning of our Atlantic crossing adventure! Here’s to a safe crossing for Miss Tiggy. Such an amazing experience Tig – loving your blogs. Big adventure Tiggy & James. Sending good vibes for the crossing!